I know you might be thing what this post is — Crow Photo? 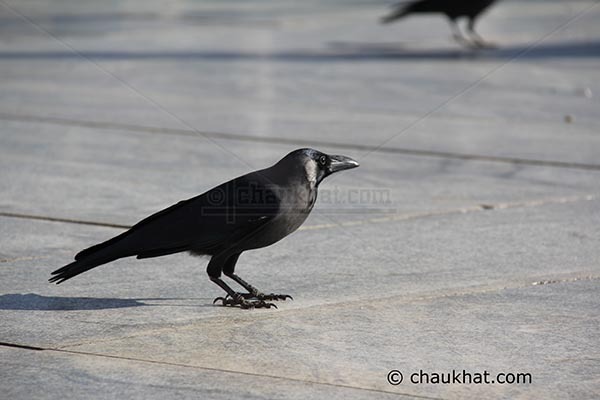 How can someone like a crow, take its photo, and to top it, publish it on a blog? Silly man he must be! Yes I am silly, because the light, the condition, the compose, the groomed crow, all was so perfect that I could not resist pressing the button. While taking this crow photo, it was a surprise seeing through the lens that the crow was quite groomed! I mean, see the finishing. It seems that the birds in villages and in wild are quite neat compared to those in the cities. The one in the below photo was in a rural area, photographed in the premises of Balaji Temple Pune. A few months back, I had published a crow photo from wild also. 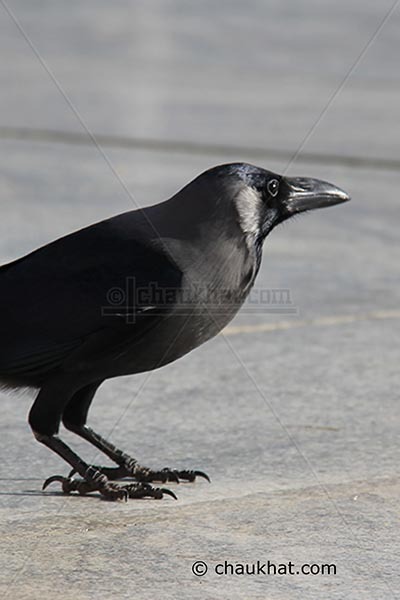 See my post of a wild crow. I do love crows (although the ones we call crow in Australia is actually a raven). I love your groomed one, standing in the light! He is very shiny. I read once that crows are extremely intelligent birds. I just recently did a post and pictures about the ravens ( they are in the crow family ) at the Tower of London in England, kept there because, it is said, if they leave the Monarchy will fall. A ravenmaster cares for them, his salary paid for by the Crown. That's a really neat crow. I don't like crows so much though. Wow what a difference. The photo you posted here in this post is amazing. Very unusual for the crow to be that groomed. On the side note, I started to blog couple of days ago, and it seems like the theme is snow and crows, lol. @ Anna: That's quite a contrast Anna! Hello!I think these are beautiful photos! what a beautiful photos,i love it. There is nothing silly about photographing a crow. I feel that's where a true photography lies, when the commonly neglected stuff become the central focus of uniqueness, thus turn it into a beautiful appreciation. Sweet looking crow. Good job Bhavesh. @ cyclopseven: You have a great opinion. Thank you for your appreciation! The crow definitely looks groomed! But I prefer to call them raven. But anyways, that was a nice shot! And I can really see that you've been to a lot of places. I envy you. I don't have that much time to travel and only feed my wanderlust on pictures of other people's adventures. Someday, I will travel and will share my adventures. Will be visiting again here soon. You've just inspired me. @ Anne: Hi there, thanks for visiting my blog and commenting here. I am glad that you liked my travel photography and that you will visit again :) Actually, I too don't have much time to travel; I just try to make the most out of the time I sometimes get in hand. And so this crow photo!